Melt butter in a saucepan over medium heat. Add flour and cook, stirring with a wooden spoon for 2 minutes. Increase heat to medium-high, and slowly add hot milk. Cook, whisking constantly, until thickened, 5 to 6 minutes. Remove pan from heat, and add salt, pepper, nutmeg, and 1/2 cup Gruyere. Set bechamel sauce aside. Lightly brush 4 slices bread with mustard. 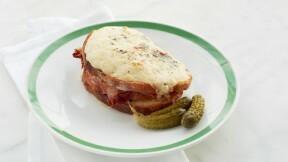 Divide ham evenly between bread, and sprinkle each with 2 tablespoons Gruyere. Top with 4 more slices toasted bread. Slather tops with the bechamel sauce, and sprinkle with remaining Gruyere and herbes de Provence. Bake sandwiches until topping is lightly browned, 12 to 15 minutes. Serve hot with cornichons.